There are so many! The physical benefits of this practice are so vast, that I’d go as far to say that this is the main reason people take interest. Every posture targets a certain part of the body and/or multiple parts of the body to either strengthen or lengthen the muscles. The postures are designed to circulate the blood and create more oxygen in the cells leaving everything from the internal organs, hormones, bones, nerves and muscles feeling happy and healthy. This is the most basic standing posture, to the outsider it may look like you are just standing there, but this is an asana that can really help find the bodies true posture by coming into alignment. Standing poses are very important when it comes to building stamina, these asanas bring attention to how we stand and correct a posture we may be carrying that is potentially damaging to the body. Learning the basic position of standing firmly on the legs, supports even weight distribution and honors the positioning of a healthy spine. To get into this posture, stand with your feet hip width apart and feet parallel to your mat. Lift and spread toes and the balls of your feet, rock back and forth and side to side. Gradually reduce the swaying to a standstill, with your weight balanced evenly on the feet. Firm your thigh muscles and imagine a line of energy all the way up from your feet, along the inner thighs and to the groins and from there to the core, torso, neck and head and out through the crown of the head… become one long line of energy. Lengthen the tailbone toward the floor and lift the pubis toward the navel. Press your shoulder blades into your back, then widen them across and release them for your back. Let the arms fall beside the torso, palms open and energetic. Not just standing there anymore….are we?! Stay in this pose for 30 seconds to 1 minute, breathing easily. The benefits of this posture include: Improved posture, strengthens thighs, knees and ankles, a firmer abdomen and buttocks while also reliving symptoms of sciatica as well as reduces flat feet. With various postures to try and different styles and techniques to practice the poses, along with a long list of physical rewards, this practice won’t disappoint. One of the beauties of this practice is that Yoga is available to any and all. 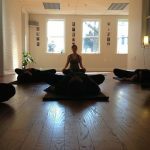 From Restorative/Yin and various Therapeutic styles for a deeper stretch and a more gentle approach to working with all types of bodies, to Hatha/Vinyassa/Ashtanga flow styles that strengthen and build endurance, every one can reap the enormous benefits. In short: a body that is more open, flexible and strong.